A Little Kindness Never Hurt Nobody | For the Joy of Life. I've been thinking quite a bit about this topic lately and it just so happens that I made a guest appearance on Steffanie's (from The Urban Hare) mocktail periscope series and the topic was on being kind. This topic has been on quite a few mother's (or parents in general) minds lately based off the current tragedies that have made the news. It is interesting, and quite frankly, annoying, that the parents of these children have become the subject of ridicule online as they mourn the loss of their child. No parent wants to outlive their child. Ever. The thought alone makes my heart ache. So what's interesting to me, is that others can't seem to offer their condolences to these families but instead feel the need to tell them that the death of their child was their own fault. Seeing the cruel remarks of those hiding behind a computer screen makes me sick, and it needs to stop. Now. These words are harsh and unfair, and truly will do nothing beneficial in the end. You see, It’s easy to throw other parents under the bus when something horrific happens because we want to believe that we are somehow better. It's easy for parents to believe that their "superior parenting" can prevent a tragedy and that bad things can only happen to an "irresponsible parent." Want to know the truth? Bad things happen to good parents, good families, good people... and when those bad things strike they deserve our empathy, and never our judgement. Somewhere around 10 months ago, when Oaklyn wasn't quite mobile, I was able to set her on top of my bed without worry. In the mornings, she would lay next to me as I would relieve myself from the night and pump to supply food for her. She would smile and grab her toys as we laid there together. One morning I got bored while pumping and turned my head for a split second to grab my phone. When I looked back she was already off the bed, in mid air, about to fall on the floor. Her little body hit and she instantly began to scream. I jumped off the bed and frantically grabbed her. We spent the rest of the morning rocking on the rocking chair as I probably whispered "I'm sorry" 100 times in her little ear. The reason I share this story with you, is because it is an example, though far less tragic, that resembles what is currently happening. I'm sure it would be easy for a lot of you to say that I should have just kept my eyes on her and that wouldn't have happened. I'm also sure that some may say I shouldn't be so glued to my phone and that my daughter wouldn't have fallen. But what I'll tell you, is that it was an accident. It was an accident I wish would've never happened, but it did and accidents happen often. Especially when you are a parent balancing a million things every single day. There is no such thing as a perfect earthly parent. So to all of you other imperfect parents out there, I beg you, to stop shaming and blaming all other mothers and fathers that are just trying to do their best daily. My heart breaks for all of the families that lose their children to bizarre and horrific accidents daily. We all often point fingers, but try instead, to take the high road and show kindness to those in need. Instead of criticizing and ridiculing, try uplifting and rallying around others. It's much easier to smile than frown, and it is much easier to share a good thought than to deny it. Try your hardest to be soft and kind instead of letting the world make you bitter and hard. If the words you wrote on social media appeared on your skin, would others still think you are beautiful? We all say that we want to teach our children to be kind and uplifting, well the best way to do so, is to practice what you preach. So I encourage all of you to back up other parents instead of tearing them down. Parenting is hard enough, we don't need bystanders making it harder. 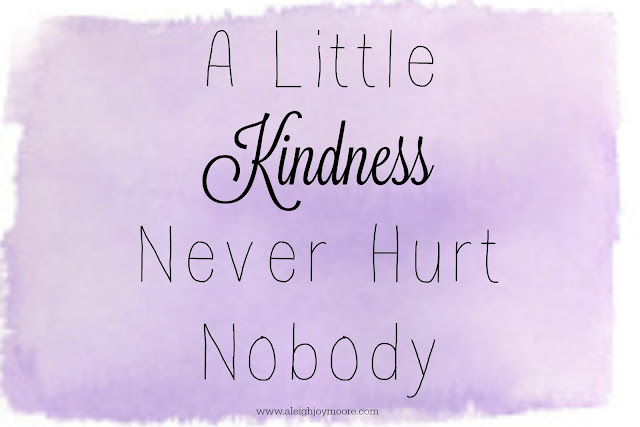 And always remember, a little kindness never hurt nobody. I loved this! It is so very true. I don't get why we have to be so quick to judge when like you said there is NO perfect earthly parent. Thank you for writing your thoughts down and for sharing them!